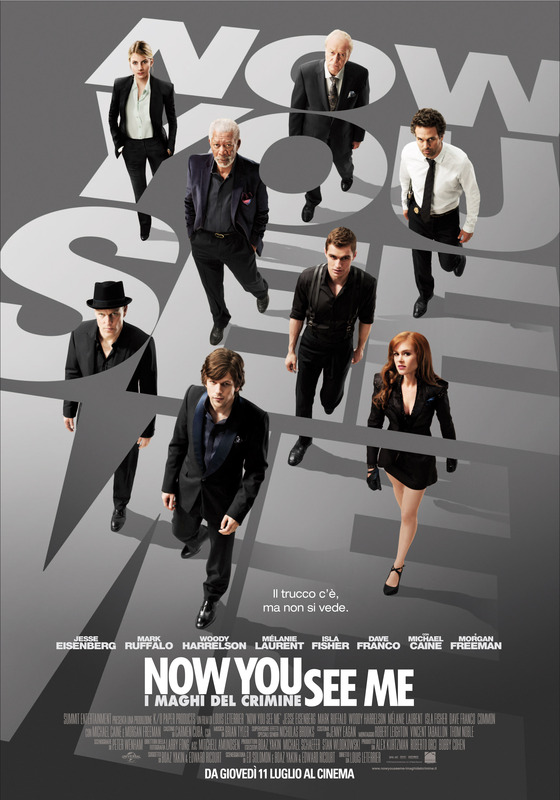 Grandeur is imperative for suspending disbelief, whether it is an illusion or cinema, and it is that grandeur in Now You See Me that allows the film to present the assumption that there is a trick around every corner. Magic and cinema have always had a close relationship, from the moment George Mêlées recognized that physical film can be manipulated to his liking. Now You See Me tends to focus on the inherent ideology that both magic and cinema can insert into unsuspecting audiences; that either medium can force an audience to believe in things that they would not ordinarily believe. Four individual small-time illusionists, J. Daniel Atlas (Jesse Eisenberg), Merrit McKinney (Woody Harrelson), Henley Reeves (Isla Fisher), and Dave France (Jack Wilder), dubbed the Four Horsemen, are given the blueprints to pull off a trifecta of elaborate and highly televised illusions. These events result in grand theft from three institutions, with their wealth re-distributed to the audience in attendance. FBI agent Dylan Rhodes (Mark Ruffalo) and INTERPOL operative Alma Dray (Mélanie Laurent) are assigned to track the four and recover the missing cash. Popular Illusionist Whistleblower Thaddeus Bradley (Morgan Freeman) is also perplexed by the Four Horsemen’s ability to stay ahead. Like a great magician, a film is supposed to be ahead of its audience, otherwise the climax is unfulfilling. Misdirection, grandeur, and a constantly changing plot are key aspects of both magic and cinema. These themes explain how the Feds and the audience are constantly fooled. Dray, who acknowledges her ignorance of magic and illusion, takes the initiative by reading up on the history of magic, realizing that a secretive organization called The Eye maintains an elite grasp of the world’s most talented illusionists, and might be the silent puppet master of the Four Horsemen. Now You See Me always has its guard up and is continuously moving. Not just the plot, but the camera is literally moving at all times, as if it could not even sit still for its own tricks. While the plot is able to create an inquisitive puzzle for the audience, CGI takes care of all the real tricks in the film. How did all this money disappear from one side of the world to another? How can we make people disappear into thin air? Not only does Now You See Me tell us through flashback, any real illusions are covered up with CGI. If this was a quarter of a century ago, there would have been a real attempt to use practical effects to make these illusions seem real. Thankfully, there is an above average plot to guide us from focusing on the artifice of magic and concentrate on who is behind the unstoppable Four Horsemen. Of course the film has embedded the idea of misdirection, provoking a constant need to question the role of each character in the film. The squabbling between the Four Horsemen, the muckraking of Bradley, or perhaps that random assertion of Dray’s assignment to work with McKinney, all incite the question of which one of these characters is/are behind The Eye. Like any magic trick, there is a surprise twist at the end, but it is up to the audience to decide if the moments in between were worth the ninety minutes of misdirection, chases, and tells. After all the smoke clears and the mirrors fall away, what is left is a movie that is merely average and where the performers simply utilize their inherent characteristics that made them household names. All the tricks in Now You See Me amount to a thinly veiled comment on corporate interests, but the time taken to discuss the scandals is minimal compared to the time taken to woo crowds with smoke and mirrors.